PPD (International) is part of the PPD Group of companies. The PPD Group are specialised Process Design Companies working worldwide in the Pulp and Paper Industry. PPD (International) was established primarily to serve the Pulp and Paper Industry in Asia. PPD's policy of remaining small and efficient means we can be cost effective at all levels. This coupled with our experience, design tools and contacts allows us to provide a level of service exceeding that of the larger consultancy groups. PPD's policy of retaining our core skills of Mechanical and Process engineering adds to our experience with every project we undertake, whilst allowing us to utilize either local consultants or our own partnership resources for specialised services such as for civil design. 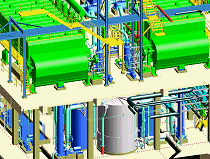 Electrical and Instrumentation design is available throughout the Group. We prefer a project to include direct contact with the clients Management, Engineering and Production personnel to incorporate the considerable local and specialised knowledge into our designs. In South East Asia PPD work alongside our partner companies Vietpaper JSC (based in Vietnam) and Jucksarn Company Limited (based in Thailand) who can provide a local presence and skills in addition to our expertise and experience. These partner companies are comprised of experienced engineers who have all worked within the Pulp and Paper Industry for many years. "Our principle is to work with and for the client"
The PPD Group specialise in a range of services from Feasibility Studies, Engineering Design through to complete turnkey installations. Additional services for any discipline are available through our networking partners.